The University-Model® School offers a challenging academic track in the context of Christian values. The school unapologetically speaks and teaches in a manner consistent with the school’s statement of faith, emphasizing the necessity of a personal relationship with Christ and growth in Christ-like character. The school integrates the Christian faith, formation in virtue, and a biblical worldview into the context of each subject area, to the end that character building that begins in the home receives support and reinforcement throughout the school community. The school properly places students in an appropriate stage of academic development. In addition, the school offers academically challenging college-preparatory courses that integrate the age-appropriate level of parental involvement into each student’s satellite classroom experience. The teachers are in charge of all direct instruction in the central classroom, and they encourage and expect students to learn the material assigned through independent practice and homework. Teachers also provide consistent feedback to students and parents regarding the progress in each class. While we are fully aware of state regulations of private schools, including compulsory attendance laws, we believe the University-Model® offers a rigorous, college preparatory education that is second to none. Validation of the University-Model® by the entire educational community proves its value as a highly credible alternative model of education. The Advanced Accreditation of NAUMS, Inc., along with the growing number of accredited NAUMS* (National Association of University Model Schools) member schools, supports this belief. *Heritage Leadership Academy is a member of NAUMS, working toward certification and Advanced accreditation with the next two to three years. The University-Model® restores the gift of time to parents. In general, the model is a five-day academic program with students spending three days in the classroom at school and two days in their “satellite classroom” at home. Both “classrooms” are under the supervision of the professional educator at the school. The key to the success of the concept is the integration of a biblically-based, parentally-guided, Christian faith and a sound, teacher-facilitated, academic environment. Parents partner with professional educators in this educational process. Under the supervision of the qualified educator, parents are required to provide oversight responsibilities of their children’s coursework in the satellite classroom at home. They also serve as paraprofessionals by providing extension, enrichment, tutoring, and study skills instruction. As the level of parental involvement progresses from a private tutor (elementary) to a guide (junior high) to course monitor (senior high), parents are expected to continue exercising responsibility for their children through graduation. Because the goal is to prepare students to become spiritually and academically independent, the University-Model® provides a gradual transition from the home to the school. Since younger children typically need more time at home, we recommend that full-time elementary students attend school two days a week, while being in the home three days a week. When students reach the middle school age level (sixth or seventh grade), their time generally increases to three days in the central classroom and two at home. The goal is to introduce upper level students to a college schedule, attending school whenever classes are scheduled, but not spending full days in the central classroom. NOTE: In 2010, the NAUMS, Inc. Board of Directors voted to permit the boards of University-Model® schools to implement three-day programs for full-time elementary students. While the two-day elementary schedule is considered ideal, schools are permitted to implement three-day elementary programs. For upper-level students, University-Model® schools should provide a college-simulated environment. This requires the school to schedule sixty (60) minute classes on Monday/Wednesday/Friday and longer classes, usually ninety (90) minutes, on Tuesday/Thursday. 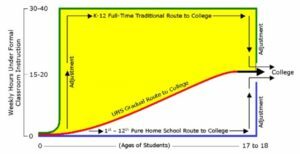 The chart shows the academic benefit of gradually preparing students for direct entrance into college vs. an approach that requires significant adjustments. On the left side of this diagram is the number of hours each week students are in a classroom guided by a professional teacher. On the bottom, from left to right, are the ages of students up to 18, the typical age for high school graduation. The bright yellow portion of this diagram is the additional amount of time the University-Model®, in contrast to the traditional model, gives back to parents. According to information gathered by pollster George Barna, the most critical period when 94% of all boys and girls come to a saving faith in Christ is before the age of 18, and 90% before the age of 14. Only 6% will make that decision to accept Christ between the age of 18 and their death. Since parents are the most influential factor in this decision, it is vital that models of education exist that keep parents involved with their children during the early, critical years of a child’s education and spiritual formation. *All content on this page is sourced directly from the NAUMS website. To learn more, visit www.naums.net.